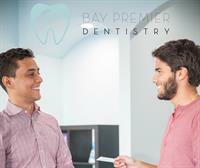 At Bay Premier Dentistry we strive to create a dental practice that keeps our patients excited about their dental health. Providing restorative, cosmetic, and emergency services in a contemporary environment with the latest technology, we aim to be a leader in dental care. Dr. Bishara promises our patients an environment where they feel comfortable but most of all, completely satisfied with their treatment. Come by and see us, catch up on your favorite Netflix show, and get taken care of.